Have you built a WordPress Website recently? And now you are struggling to decide which WordPress Contact form plugins to add to your Website to enable users to contact you via email? If you are one of them and still unable to decide which WordPress contact form plugin to pick out of 1000+ contact form plugins then this post will help you find the best free WordPress Contact from plugins. Which is the Best Free WordPress Contact Form Plugin? One of the most popular WordPress Contact form plugins with active installation of 5million+. It is one of the most downloaded contact form plugins for WordPress and the most wide used by the websites around the world. You can manage multiple contact forms with just one Contact form 7 plugin for WordPress, customize the form fields, mail contents and much more with simple markup or drag and drop functionality. Contact form 7 supports Ajax-powered submitting, CAPTCHA, Akismet spam filtering etc. Extensive documentation is available from the developer to help you with any queries, bugs and issues that you may face. However, this contact plugin is updated on a regular basis by the developer so bugs and issues are well taken care off. With a simple philosophy that contact form should be simple and powerful the wpbeginner team has built this WordPress Contact form plugin. It’s very user friendly, offering simple drag and drop functionality to create contact form for WordPress website in minutes. You can create various types of forms such as contact forms, subscription forms, payment forms or even email opt-ins using WPForms plugin. It is a 100% mobile responsive contact form plugin and therefore all your contact forms will always look great on all devices be it a desktop or a mobile phone. Another very popular WordPress contact form plugin with active installs of 1million+. 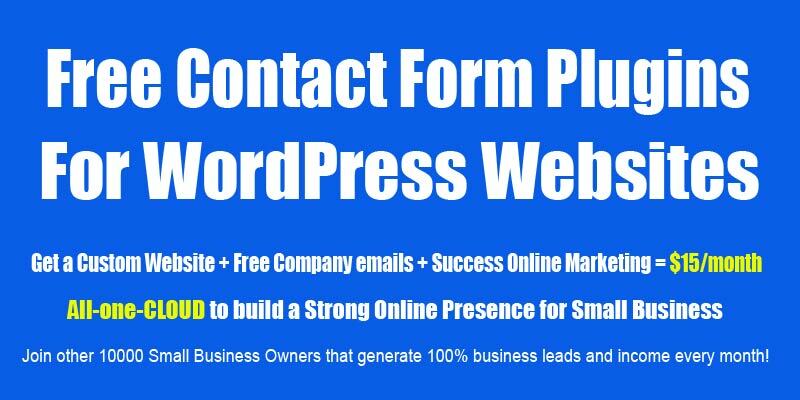 It is a free tool for creating contact forms for your WordPress website. You can build forms within minutes using a simple yet powerful drag-and-drop UI. If you are beginner then you can build complex forms without any coding or programming knowledge and if you are a developer then you can utilize the built-in hooks, filters, and even custom field templates to do whatever you need at any step in the form building process. With Ninja Forms you have no limitations on the number of forms that you can create, fields, emails, actions or submissions. Anti-spam feature which includes Google reCaptcha, question/response fields, and honeypot fields makes it even more powerful and AJAX form submission gives a seamless user experience. If you are looking for some intuitive WordPress contact form plugins with drag and drop functionality then you can go for Form Maker. It offers an intuitive interface that allows anyone with no coding or scripting background to create contact forms within minutes. Each contact form is responsive and you can further customize them with your own colors and data fields. The free version of this plugin offers upto 7 form fields with 3 types of captcha protection but you can create unlimited number of forms and display them on your WordPress website. There are four display options for the forms such as Embedded, Pop-Up, Scroll-box, and Top-bar. With an active install of over 200,000 formidable forms plugin can be used for building any type of form for your WordPress website such as contact form, surveys, quiz forms, registration forms, payment forms, purchase forms, email marketing forms etc. It also offer drag and drop functionality for building forms and is the among the most extendable WordPress contact form plugins. To get started easily Formidable forms offer a pre-built contact form template while you can also start creating contact forms from scratch using its drag and drag feature. Formidable Forms is also 100% GDPR compliant and you can turn off IP tracking or stop saving contact form submissions entirely. Just like other WordPress contact form plugins Everest Forms also provides a drag and drop user interface to create contact forms and several other types of forms. It allows WordPress beginners to create forms within minutes and start using them on their WordPress websites. This plugin is lightweight, extendible and 100% mobile responsive and several pre-built templates and design layouts allow you to create forms that look professional and clean. You can create unlimited forms without any restrictions and it supports all commonly used form fields such as radio options, dropdowns, checkboxes, date etc. It supports multiple column layout, Short codes, Multiple email recipients and Mulitple email notifications. Cladera forms has over 100,000 active installs and it is a free WordPress contact form plugin that creates responsive forms with a simple drag and drop editor. Its visual editor simplifies complex form building for WordPress Websites. It supports multiple columns, conditional logic and you can also add additional pages. Supports anti-spam, AJAX form submission, notification emails and database entry tracking are enabled by default. You can create as many forms you want with as many fields as you want. There are no restrictions! It is a pretty straight forward WordPress contact form plugin that is built with just one objective in mind that your customers can contact you. It works with a shortcode that you can paste anywhere on any page, post or widget to display the form. You can also customize the form styles and contents easily with the pre-build options, it is GDPR Compliant and has a responsive layout. Supports two column layout, you can change the width for contact form and also re-order form fields using drag & drop interface and anti-spam using Captcha or Google reCAPTCHA. Another WordPress contact form plugin by WebDorado which is built to quickly setup a form for your clients and visitors. This form includes all commonly used form field types necessary to create a complete contact form and you can activate or deactivate them as well as rearrange according to your needs. It comes with 10 default form templates that you can utilize to create new forms, change the labels, content and options for each form. Offers support for Google ReCaptcha and simple captcha for avoiding spam and Google maps integration. All the Plugins that are mentioned on the list above are free and you can easily create contact forms for WordPress Websites within minutes. However, you can test each one of them and then pick the best WordPress contact form plugin that suits your needs.